The step taken by the U.S. in Pastor Andrew Brunson's case does not reflect a strategic partnership, it is a serious disrespect against Turkey, President Recep Tayyip Erdoğan said Saturday. Speaking at the women's branch convention of his ruling Justice and Development Party (AK Party), Erdoğan slammed the recent decision to freeze assets of Turkish Justice Minister Abdülhamit Gül and Interior Minister Süleyman Soylu for the alleged restriction of religious freedom in Brunson's case, who is being accused of links with the Gülenist Terror Group (FETÖ) and the PKK. "The decision to freeze assets of Turkish justice, interior ministers in the US is illogical. Turkey will also freeze all assets of the US justice and interior ministers, if they have any. Turkey cannot be disciplined with such actions," Erdoğan said. The president also called on his U.S. counterpart Trump to "spoil this game." 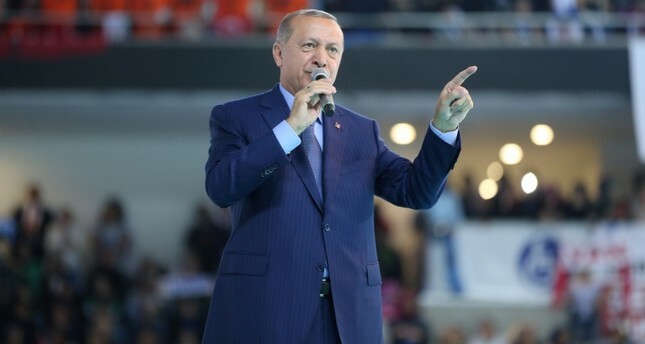 Erdoğan also criticized reports on links with Brunson's case and the case of Mehmet Hakan Atilla, the deputy general manager of Turkish state lender Halkbank who was sentenced to 32 months jail in the U.S. for evading Iran sanctions. "We did what the state of law requires [in Brunson case]. It is not up to anyone to make Halkbank pay a price. Do not enter in a swap with us by arresting the deputy general manager of Halkbank, who went to the U.S. and came back six times," Erdoğan said. Brunson, a Christian pastor from North Carolina who has lived in Turkey for more than two decades, was indicted on charges of helping FETÖ, which is responsible for the failed 2016 coup, as well as supporting the PKK. Serving at the Diriliş (Resurrection) Protestant Church in western province of Izmir, Brunson was arrested in October 2016 and moved to house arrest on July 25.